Description: Embedded Courts is laden with tension. Chinese courts are organized as a singular and unified system yet grassroots courts in urban and rural regions differ greatly in the way they use the law and are as diverse as the populations they serve. 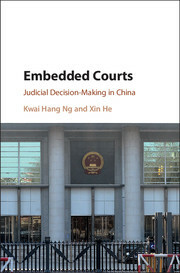 Based on extensive fieldwork and in-depth interviews, this book offers a penetrating discussion of the operation of Chinese courts. It explains how Chinese judges rule and how the law is not the only script they follow - political, administrative, social and economic factors all influence verdicts. This landmark work will revise our understanding of the role of law in China - one that cannot be easily understood through the standard lens of judicial independence and separation of powers. Ng and He make clear the struggle facing frontline judges as they bridge the gap between a rule-based application of law and an instrumentalist view that prioritizes stability maintenance. Professor Donald Clarke of George Washington University Law School recently commended the book on The Chinese Collection blog (4 May 2018). Professor Clarke wrote: "I cannot recommend this superb book highly enough... The authors combine years of fieldwork with sophisticated theoretical insights, and present it all in an engaging style that is refreshingly free of pretentious jargon... [I]f you read (or recommend to someone else) one book on Chinese law, this should be it. I can't think of a better one out there."